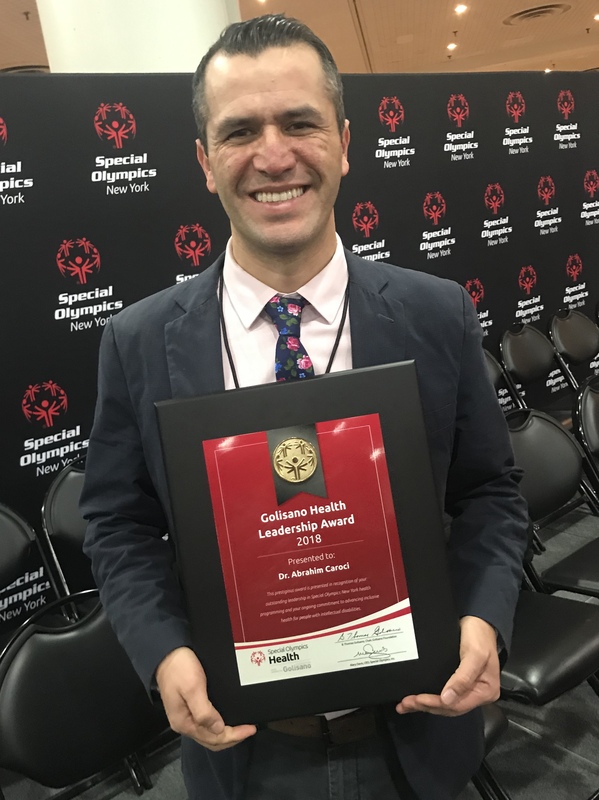 December 8, 2018--NEW YORK CITY, NY –Special Olympics New York President and CEO Stacey Hengsterman and Golisano FoundationExecutive Director Ann Costello announced today that Rochester, NY pediatric dentist and Special Olympics Clinical Director Dr. Abrahim Caroci will receive the 2018 Golisano Health Leadership Award for New York State — the highest regional honor for Special Olympics health partners. 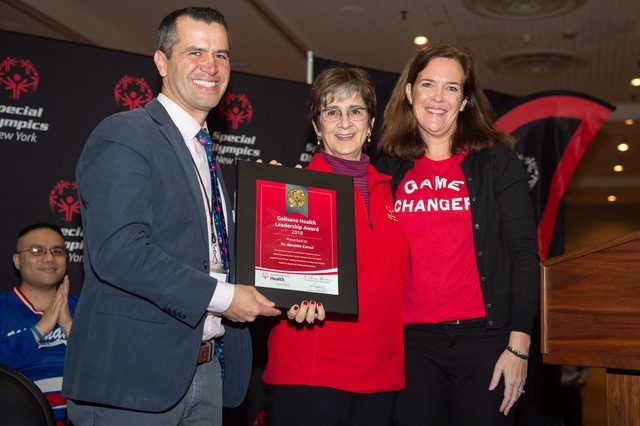 The award was presented to Dr. Caroci Saturday, December 8th at the Jacob K. Javits Center in New York City at the Special Olympics New York Floor Hockey Winter Classic. The presentation was a part of the Opening Ceremonies. Dr. Caroci is one of only 109 individuals and organizations in the world to be honored this year with the Golisano Health Leadership Award. He is the second individual to be honored from New York State since the awards were established in 2016. Dr. Steve Sulkes received the Golisano Health Leadership Award in 2016 for New York State and also went on to receive the Golisano Global Health Leadership A ward in 2017. Beginning his work with Special Olympics Special Smiles in Arizona, Dr. Caroci went on to be a part of a research delegation in two Summer Olympic Games in Athens, Greece and Los Angeles. Since moving to Rochester in 2013, he has become a Special Olympics Special Smiles Clinical Director, helping to coordinate projects locally and statewide. He is also a board member of the American Academy of Developmental Medicine and Dentistry, which focuses on integrating the medical and dental fields to serve people with intellectual and developmental disabilities. Ann Costello said, “One of our chief missions at the Golisano Foundation is to improve access to inclusive health. When it comes to inclusive dentistry, Dr. Caroci is a pioneer. He is deeply committed to treating and caring for underserved populations." Dr. Steven Perlman, global clinical advisor and founder of Special Olympics Special Smiles, said, “For healthcare professionals, it is said that ‘the secret in caring for the patient, is caring about the patient.’ Dr. Caroci has not only demonstrated that with his patients, but has embraced his work with Special Olympics with the same integrity, enthusiasm, passion and compassion. The philanthropy of Tom Golisano has provided the vehicle for healthcare superstars like Abra to flourish, to help create innovative programs, to mentor students and provide health services to help our athletes lead healthier happier, and more productive lives." Dr. Abrahim Caroci is a pediatric dentist at Twelve Corners Orthodontics & Pediatric Dentistry in Rochester, NY where he is committed to offering children and families high quality service and care for long lasting healthy smiles. He graduated from Arizona School of Dentistry & Oral Health at A.T. Still University and also received a certificate in Public Health. He completed a General Practice Residency (GPR) and Pediatric Dentistry Residency at the Strong Memorial Hospital/University of Rochester Eastman Institute for Oral Health. Dr. Caroci's training included hospital dentistry, management of trauma, infections, sedation, dental treatment under general anesthesia and special needs patients. He also completed a one-year fellowship in the Leadership Education in Neurodevelopmental Disabilities (LEND) program. This collaborative interdisciplinary training focused on improving the health of children with neurodevelopmental disabilities and special health care needs. Born in Brazil from an Italian father and Brazilian mother, Dr. Carcoi fell in love with pediatric dentistry while working alongside a volunteer dentist during a dental mission in the Amazon. At the time, he was completing a Masters degree working with malaria vectors and mosquitoes in the field of epidemiology and biomedical sciences. He continued his research and worked toward a Ph.D., spending four years as a Research Scholar at the University of Arizona and the University of California, Irvine. After this time, he decided to finally follow his true passion and changed career paths to pediatric dentistry. The Golisano Foundation is one of the largest private foundations in the nation devoted exclusively to opening doors to opportunity, changing negative perceptions and stereotypes, and forging unprecedented partnerships to ensure individuals with intellectual and developmental disabilities have pathways to personal dignity, independence and the best possible expression of their abilities and talents throughout their lifetimes. The foundation was founded in 1985 by Tom Golisano, entrepreneur, civic leader, philanthropist and the founder and Chairman of Paychex. Mr. Golisano’s philanthropy now exceeds $300 million. In addition to Mr. Golisano’s personal philanthropy, the Golisano Foundation awards about $2 million annually to non-profit organizations serving people with intellectual disabilities in Western NY and New York's Finger Lakes Region and Southwest Florida. For more information see golisanofoundation.org.